In this section we are interested in giving a heads-up to cool art coming from UK ceramic studios. Not sure why or how, but in the UK, we generate a culture of creativity which is only matched by British business industry's ineptitude at backing it. This is huge hobby horse of ours, and is key to why, in our opinion, our beloved China & Potteries Industry went down the swanee in the UK. Just at a time when bosses of china firm should have been giving the creatives their head, they were suppressing and oppressing them (we know, were there). So, rising from the ashes of that fraught experience, is this website, and, in particular, this section. The fabulously successful period of Royal Doulton at the beginning of the 20th century was fuelled by Henry Doulton's obsession with backing the creative art team and employing a young and forward thinking factory manager to carry out the artistic outpourings. That cultivating capacity within management was rare, and got rarer the 21st century wore on. Backing British creativity is what we are about. 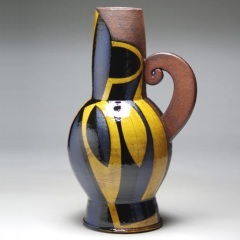 Showcasing the talent in our sector (ceramics) is our reaction to the usual indifference. We are saying "look; this is what we have, cherish it!". Some people say that the difference between art and design is that while art is a means of personal expression, design creates objects which please the senses of the beholder. One is inwardly authored, the other outward. Beauty, of course, as the old expression goes, is in the eye of the beholder. Well, we at Ceramic Fusion believe the artists featured in this 'cool art' section are using the medium of clay and ceramics both as a form of expression, and are also pleasing our senses very nicely, thank you. So right there is the blend we are looking for in this segment. Lisa Katzenstein has a mood which we simply know is unique. 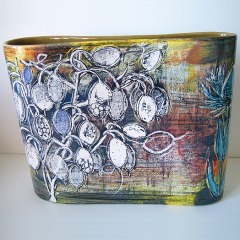 We know because we look at hundreds of ceramic artists - her art truly is 'cool ceramics'. James Ward (Jimbo), in his own words, is an obsessive "drawer of things on things". Is that art or design? 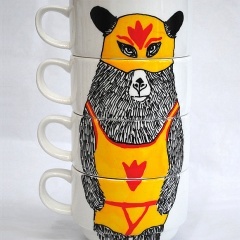 Who knows; what we do know is that his stacking coffee cups give us a cool mugs for the kitchen. 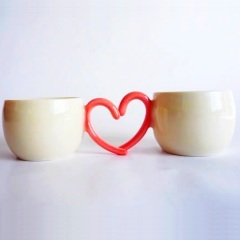 The Namnam collection of ceramics by London based artist Namiko Murakoshi is one part of her creative output. Her Poko Poko tableware of cool china, sits alongside her porcelain origami and paperclay sculpture. Cool pottery could not be a more apt description of the work of important UK art potter Richard Phethean. Burnt Offerings Ltd are a company which, in our opinion produces cool art rather than design. 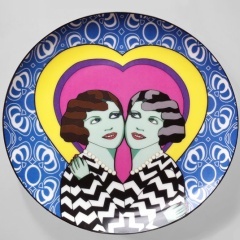 The Gilbert and George of ceramics. Certainly, their effervescent plates would augment a cool kitchen. 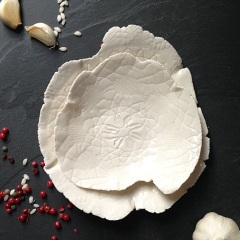 Elizabeth Prince is an artist in porcelain tableware whose handmade cool plates and other artworks have featured in The Guardian, Good Homes Magazine, Style Hive, and CUT magazine amongst many others.